The review came at a pivotal time. Over summer 2018, the 13-year-old elementary program moved from offsite to the high school’s long-time location at 801 Parkwood Drive. It is a new era in the first year of the school’s second century with all grades, K-12, together on one site. A global outlook and respect for diversity among people. Recognizing that a school’s logo is an important entry point into the school’s story, the EMS leadership team discerned that the time was right to refresh the existing logo. The flames on the updated logo respond to the survey data calling for a more active and less stationary logo. Esther Kniss ‘49 Augsburger founded the arts program at Eastern Mennonite High School in 1971 where she taught for nine years. In 1976, the board of directors approved the first logo — which Augsburger designed — for painting on the gym floor. 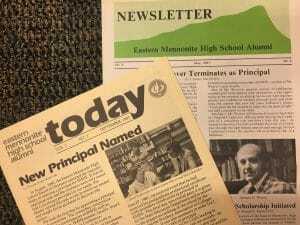 In September 1981 the Today alumni publication switched from a masthead featuring Massanutten Peak to the flame logo. The change came as the school marked the end of one era — the leadership of Samuel Weaver ‘52 — and the beginning of another — the principalship of J. David Yoder. 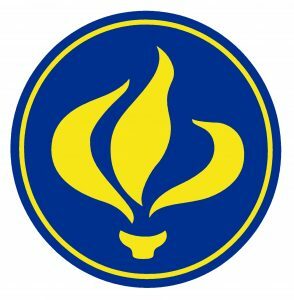 The flame logo has served the school well in various forms to the present. 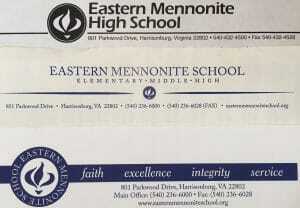 In 2008 the current seal logo was adopted as branding for elementary, middle and high school together. Blue and white were formalized at that time. The yellow or gold that had been used in the logo over the years — particularly for Flames athletics — was phased out. The revised logo was chosen by a design team including Andrew Gascho, communication technology teacher and IT support; Malea Gascho, art teacher; Paul Leaman, head of school; and Andrea Schrock Wenger, director of advancement. They heard input from the EMS leadership team, faculty, staff, students and board members. The process was led by Harrisonburg-based marketing consultants, Gravity Group. The design retains the flame motif, but is removed from the closed circle to reflect the open and welcoming spirit of the school. An accent option of gold — drawing on the historic use of gold or yellow for Flames athletics teams — will be available for design purposes, alongside the blue logo. Rollout of the revised logo began with the Student Council Organization (SCO) revealing the logo during chapel with the middle and high school on Monday, Oct. 15. It was the first day of Spirit Week leading up to Homecoming and Family Weekend, Oct. 19-21. On Wednesday, elementary students will learn about logos and see the new design in their weekly gathering. 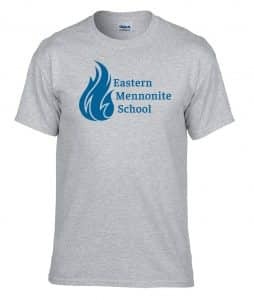 On Friday, everyone in the school — K-12, faculty and staff — will receive a grey T-shirt with the new logo. 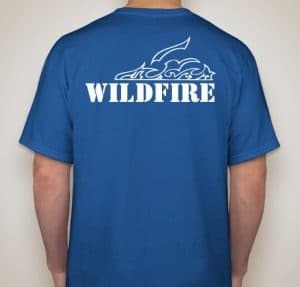 Some signed up to instead receive a blue “Wildfire” T-shirt with white school logo on front and emblem on back — designed by Afton Rhodes-Lehman ’20 — for the student pep club. The logo will be implemented as new print materials are rolled out. The new school website with the new design will be launched early in the new year. External signage and other updates will happen in a timely manner, while also taking costs into consideration.